Just because you travel light doesn’t mean you have to compromise on your music. The HPH-PRO300 gives you the best of both worlds – portability and power. Its sleek, lightweight design is perfectly matched with a bold, precise and vibrant sound. The HPH-PRO300 headphone combines the finest materials with Yamaha’s legendary tuning know-how to deliver a superb listening experience. It incorporates a newly-developed Yamaha-proprietary driver design with neodymium magnets that provide maximum efficiency when used with mobile devices such as smartphones, tablets and other portable music players. The ear cushions offer excellent acoustic properties by way of meticulous attention to material selection and shape design. From deep, tight bass to clear, precise mids and highs, the HPH-PRO300 reproduces music authentically, with a lifelike soundstage. Built to handle the rigors of everyday use without wearing you down, the HPH-PRO300 features an adjustable, reinforced headband with ample padding textured for a pleasant feel. The band is shaped to apply just the right amount of pressure – snug enough to provide some noise isolation, yet light enough for long listening sessions. Its ear cushions are extraordinarily soft and smooth, with a feel so natural you’ll never want to take it off. Drawing inspiration from the world’s finest musical instruments and motorcycles, the PRO Series headphones get your heart racing before you even plug them in. Gorgeous geometry and ultra-clean design curves are matched with premium color and finish materials, then emblazoned boldly with Yamaha’s iconic tuning-fork marque, conjuring the power and energy of our high-performance supersport bikes. The HPH-PRO300 is available in four stunning designer color choices. Not all headphone cables are created equal. The HPH-PRO300 uses a tangle-resistant flat cable made from a material that is both durable and designed to reduce “touch noise” transfer effects. An ideal length for mobile use (1.2 m), it attaches directly to a single earcup, keeping it out of your way. The flat construction separates the internal cores to minimize interference and terminates to a low-profile right-angle connector. A gold-plated 6.3 mm adapter is included in the box for connecting to professional-grade audio equipment. The HPH-PRO300 cable includes an in-line remote/mic optimized for use with Apple iPod, iPhone and iPad devices. The “+” and “-” buttons control volume for both music and phone calls, while the center button allows you to play/pause music, skip to the next song, skip to the previous song, or answer/end phone calls. The controller buttons provide a tactile click-response, enabling intuitive operation without need for visual reference. For non-Apple devices, control behavior varies due to differences in applications and pin configurations. The HPH-PRO300 offers a hinged headband that allows it to fold into a compact size for traveling. 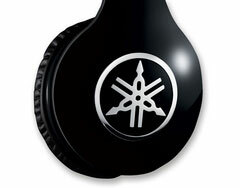 It also comes with a Yamaha soft carrying case for added protection.